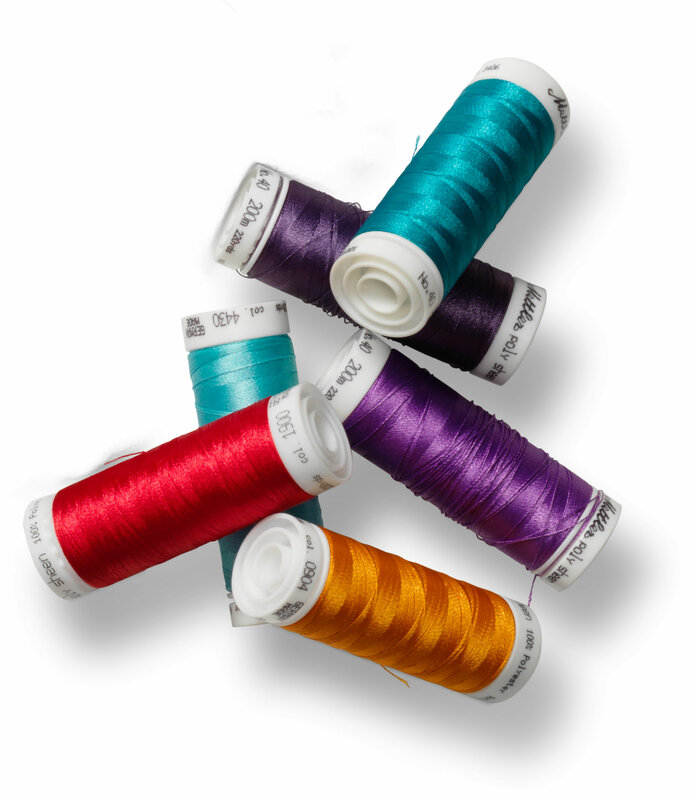 Join us this Thursday, September 17, at either 12:30 or 5:15 p.m. when Cindy Dahl will give an informative presentation about the many different types of thread and what to use when. Third Thursdays Demos are always free. Bring a friend! Take 25% off on sewing tables, cutting tables, and more. Horn of America is high-quality, made in the USA, and delivered right to your home. The sale ends this Saturday, September 19. Don't miss out! The Diva Wallet has been a huge hit with our customers, so we were thrilled to find this darling Glam Shell purse pattern that uses the same hardware as the wallet. It measures 8″ x 7″ closed and opens up to twice that size to reveal two zippered pockets, one open pocket, eight credit card slots, and a phone pocket. Perfect for every day use or when you want to travel light in style. Judy Bryan will teach this class. 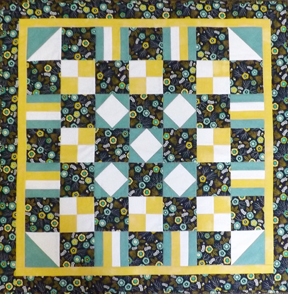 Many of us make small quilt-as-you-go projects such as placemats and table runners. 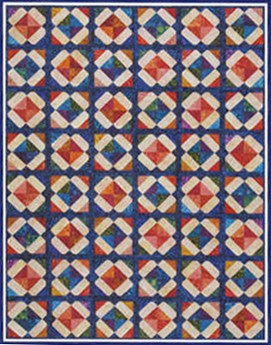 Now you can make up to a twin sized quilt using this great “Fun and Done” pattern. Judy Bryan will teach this class. See the sample she made at the shop and sign up today! 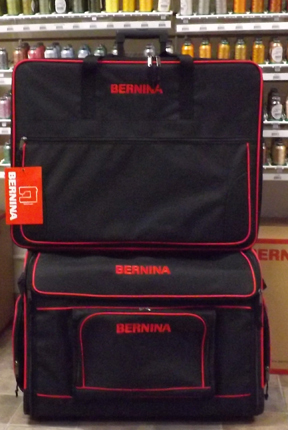 Another special offer from BERNINA! 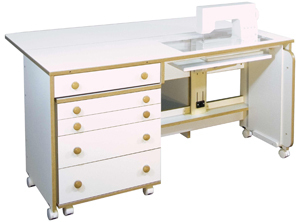 Purchase a B790 and receive a FREE suitcase set to store and transport both your machine and embroidery unit. Also, we're offering 0% 60-month financing on all BERNINA purchases of $3,000 or more. Get the details on financing here. If you've had your eye on one of the higher-end machines or the new Q20, take advantage of paying for it a little at a time. Both of these offers are good from September 15-21 only. 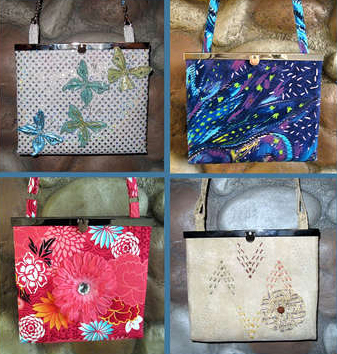 This month our BERNINA club will feature a “make and take” project. We will be making a small (7” x 27”) reversible holiday table runner. One side will feature Christmas fabrics and the other will feature fall fabric. Techniques will include decorative stitches, using a double needle, specialty threads, and a variety of feet. Bring your own sewing machine or use one of ours. The kit will include all fabric and batting for the project. Please call 970-565-7541 or e-mail Cindy no later than Monday, September 21 at 6 p.m. to reserve your space so that we’ll have enough kits made for everyone. You do NOT need to own a BERNINA to attend this event. Quilters seem to fall into one of two camps when it comes to sewing gloves . 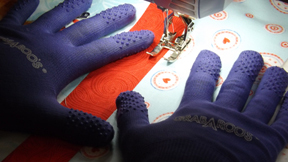 . . those who never wear then (too tight, too hot, just don't like them) and those who wouldn't dream of quilting without their gloves. If you've never tried using gloves pick up a pair at the shop (only $11.99, four sizes) and give it a go. Of course they're ideal for free motion quilting. 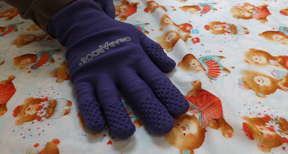 Gloves allow you to use a lighter touch on the fabric without having your hands slip and slide. 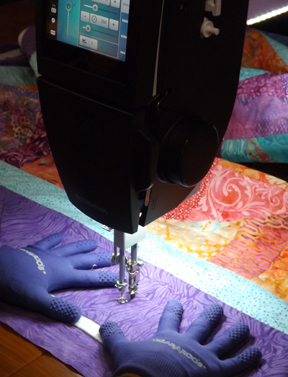 Use gloves when doing stitch-in-the-ditch quilting to gently open up the seam for better visibility and accuracy. And when you're sandwiching a quilt and getting it ready to pin, gloves make smoothing the fabric out on both sides a breeze.